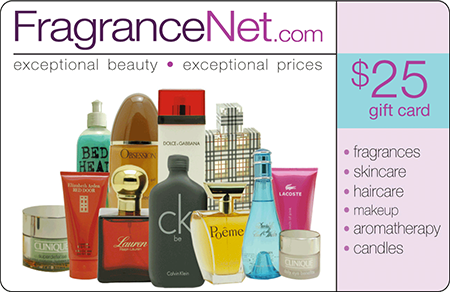 With more than 16,000 genuine brand name products, FragranceNet.com is a leading retailer of designer fragrances, skincare, haircare, makeup, candles, aromatherapy and more. All at discounts of up to 70% off department store prices. Use FragranceNet.com gift cards everywhere! Why choose FragranceNet.com gift cards? Q. Is there a minimum gift card order? Yes, our minimum opening order is $1,000 at face value. Thereafter, the minimum order is $500. Q. Are there discounts available for bulk gift card purchases? Yes, we offer generous discounts based on annual volume. Q. What gift card denominations can I get? Your choice of denominations includes: $5, $25, $50 and $100 for gift cards and $5-$500 on eGift cards. Q. How do I pay for my gift card orders? You can pay by company check, wire transfer, ACH or credit card. If paying by credit card, please note that discount is lowered by 2%. Payment is required prior to shipment. Q. How and when are the gift cards shipped? Orders are shipped to you at no cost via ground transportation within 3-5 business days of payment receipt. FragranceNet.com gift cards and eGift cards are shipped in bulk to a single location. Q. Are gift cards shipped activated? Yes, gift cards and eGift cards are activated when shipped. Q. Does the value of the gift card appear on the face? Yes, on both the gift cards and eGift cards. Q. Is there an expiration date on the gift cards? No, FragranceNet.com gift cards and eGift cards have no expiration dates. Q. Are there any fees if the gift cards are not used? No, FragranceNet.com gift cards and eGift cards have no dormancy fees or other fees. Q. Can the gift cards be redeemed for cash? No, FragranceNet.com gift cards and eGift cards can be redeemed for merchandise only. To obtain current balance, log in to your user account at www.FragranceNet.com. Other conditions may apply. For questions, contact www.FragranceNet.com or 1.800.PARFUMS. Q. Where can the gift cards be redeemed? FragranceNet.com gift cards and wGift cards can be redeemed online at www.FragranceNet.com. Cards/codes can be entered before beginning transaction or during check out. No limit on number of cards/codes per transaction. Q. Can lost gift cards be replaced? FragranceNet.com gift cards and eGift cards are treated as cash. We are not responsible for lost or stolen cards.